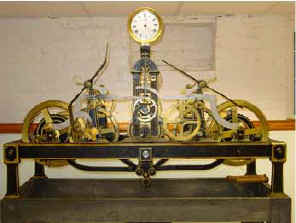 Below are pictures of many interesting tower clocks. To see a full page description and pictures of each just click on the picture. Many are unrestored, but all are complete and functional. 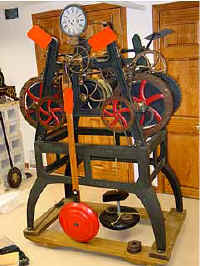 Since I only have the time to spend a few hours a week upon restoration, it takes me about six to ten months for a typical clock. 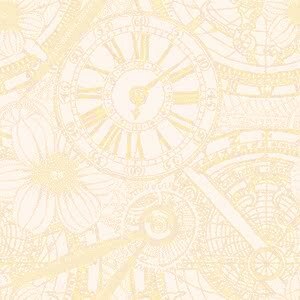 Over the years I have found that when I divide the time it takes to do a movement by the number of parts it comes out to an average of 20 minutes per piece. 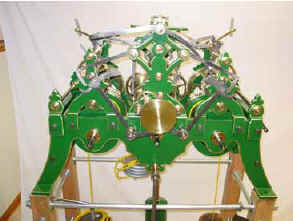 A tower clock can range from just under 100 parts to over 500 with a typical movement in the range of 250. 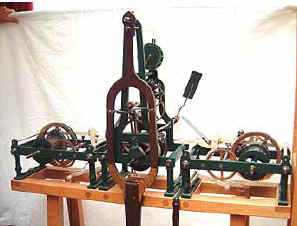 Do you know of any interesting tower clock movements for sale? Email me! mfrank1@rcn.com. 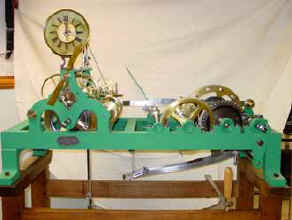 One has to marvel at the craftsmanship that many tower clock makers put into their work. 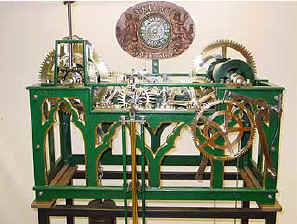 It always fascinates me the extent that some tower clock makers went through to make their movements look attractive. This only adds to the cost with no possible improvement in the clock's performance. 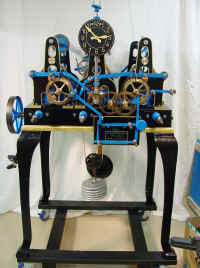 Obviously the reason was to impress the buyer, but to think that after this initial appraisal from the owner was finished, the magnificently made machine was nearly always and forever thereafter unavailable to be seen by anyone other than the clock's maintenance personnel. Tower clocks; their associated towers and upkeep were and still are expensive propositions. Also these machines had to be accurate and reliable in adverse climate, maintenance and operating conditions.